Why won't regular data CD-Rs work in my home audio CD recorder? Digital Audio CD-Rs are made specifically for home audio cd recording systems. Most home audio systems have "standalone" CD recorders, not attached to a computer, and they require a CD-R that is made specifically for Digital Audio recorders. Some manufacturers also call them Music Only CD-R or Audio CD-R. These CD-Rs are Digital Audio recorders approved and will work in standalone CD recorders. A Digital Audio CD-R uses a SCMS copy-protection flag in the sub-code section of the CD-R. SCMS is the acronym for Serial Copy Management System. Home audio standalone CD recorders are designed to look for the SCMS flag in the sub-code section before allowing the unit to record. If there is no SCMS flag the recorder will not allow recording and the CD-R will be rejected. If a CD-R is labeled Digital Audio CD-R it has the SCMS flag and will therefore work in standalone home audio CD recorders. We offer a full range of Digital Audio CD-Rs, from branded to inkjet printable to gold digital audio and even a pro audio gold. Branded digital audio CD-Rs can be used where simply writing on the surface with a CD-R pen will suffice. We also carry bulk shiny silver digital audio CDRs from MAM-A and Spin-X . The shiny silver discs are used by professionals that custom print with thermal printers like the Rimage Prism. You could also apply labels or simply write with a CD-R pen. 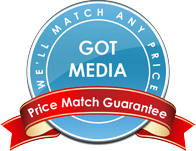 We also offer inkjet printable digital audio CDRs for those who are printing on the surface in full color. 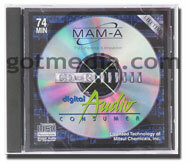 Don't forget the best digital audio cd-r ever made, the MAM-A Gold Digital Audio CD-R and Pro Audio Gold CD-R.